SO YOU THINK (NZ) (Bay or Brown 2006-Stud 2012). 14 wins-1 at 2, MVRC WS Cox P., Gr.1-twice. Sire of 236 rnrs, 111 wnrs, inc. SW La Bella Diosa (New Zealand One Thousand Guineas, Gr.1), Inference, Gold Rush, Northwest Passage, Global Thinking, Care to Think, SP Coral Coast, Mr So and So, Neguev, I Thought So, Kaching, Smart as You Think, So Si Bon, So You Too, Closer Still, Calculated, Coachwhip, The Pinnacle, Shapes, Conscious, etc. Spirit of Aquada (g. by Bel Esprit). 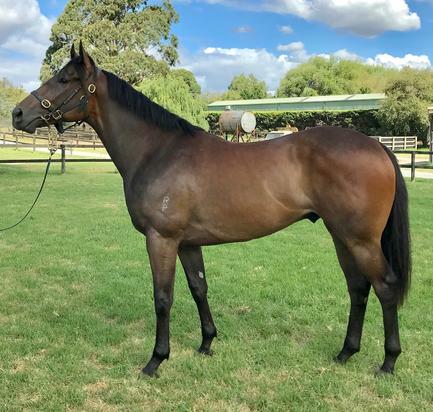 Winner at 1200m in 2017-18, 2d MRC Blue Star Print Group H., Pakenham RC O'Connor Beef H., 3d MRC Sheamus Mills Bloodstock H., Ladbrokes Cash in P.
House of Fun (Starcraft). 5 wins to 1400m, HK$7,544,050, in 2016-17, HKJC Tai Hing H., Pacific Ocean H., Pak Tam Au H., Sun Wui H., Front Loading Washing Machine H., 2d HKJC Happy Valley Trophy H., Chevalier Lifts & Escalator H., Nathan H., Racing Club H., Topaz H., 3d HKJC Bauhinia Sprint Trophy H., Gr.3, Po Yan H., Aberdeen H., Lark H.
Avonaco. 9 wins to 1350m, A$232,380, to 2017-18, ATC Ranvet H., TAB More Than Winning H., Mossman at Vinery H., Scone RC Kia Ora Stud H., 2d ATC Decorative Events H., Schweppes P., Schweppes H., 3d ATC TAB More Than Winning H.
Roses of Joy. Winner at 1200m in 2016-17, 2d GCTC Racelandia P.
Something Violet. Winner at 2 in 2016-17, MVRC Ostar International Media Group 2YO P.
Coco Couture. 3 wins at 1000m to 2017-18 in Aust. Downhearted. 4 wins-1 at 2-at 1300m, 1400m, A$192,675, to 2016-17, 2d MRC TAB Supports Jockeys Trust H., Big Screen Company H., Le Pine Funerals H., Clanbrooke Racing H., Sheen Group H., Grand Hotel Frankston H., 3d MRC Chandler Macleod H., VRC Goodwood Racecourse H.
ALIYANA TILDE (Snitzel). 3 wins from 1300m to 1900m, A$360,190, ATC Epona S., Gr.3, 2d ATC Australian Oaks, Gr.1, 3d ATC Sydney Cup, Gr.1, Vinery Stud S., Gr.1, Chairman's H., Gr.2, Illawarra TC Keith F Nolan Classic, Gr.3, ATC Aspiration H., L.
TEASPOON (Snitzel). 2 wins at 2, A$184,250, in 2016-17, ATC Widden S., Gr.3, TAB 2YO P., 3d ATC Sweet Embrace S., Gr.2. SWISH TRISH (Redoute's Choice). 3 wins at 1000m, 1100m, A$123,300, SAJC Redelva S., L, MVRC Elizapark.com.au H., 3d SAJC Yallambee Classic, Gr.2. Producer. ONE RAR (Dane Shadow). 9 wins from 1200m to 1900m, A$33,110, S$528,853, to 2017 in Aust. and Singapore, Singapore TC Causeway Classic S., L, Kranji A S., 3d Singapore TC Chairman's Trophy, L.